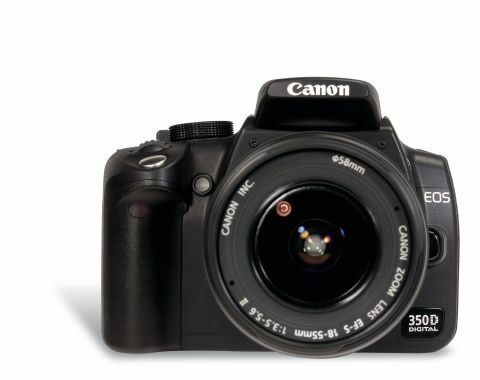 Upping the ante from the original EOS 300D, the newer 350D ushers in a 8Mp CMOS sensor, along with Canon's excellent DIGIC II image processing engine. The 350D is also smaller than the 300D, which is a mixed blessing as it can feel a little cramped for larger handed photographers. Metering performance was extremely consistent in our tests, throughout a wide range of shooting conditions and the seven-point autofocus system was excellent. Another plus point for the combination of the 350D's CMOS sensor (the only camera in the group to have this rather than a CCD), along with DIGIC II, was that image noise was very low throughout the sensitivity range, right from 100 ISO up to 1600 ISO. On the down side, the 1.8-inch LCD lacks brightness as well as sheer size. Battery life is also only moderate, returning about 600 shots between charges. The biggest disappointment, however, comes in the shape of the kit lens. As well as only offering a lacklustre zoom range at the price, of just 18-55mm, our test sample lacked sharpness and the autofocus was quite slow and noisy in operation. Of course, Canon does offer a huge range of more exotic lenses that you can go for, but at a much higher price. Many digital photography aficionados rate the EOS 350D right up there alongside sliced bread but, based on the three review samples we've seen over the last year, we're yet to be convinced.